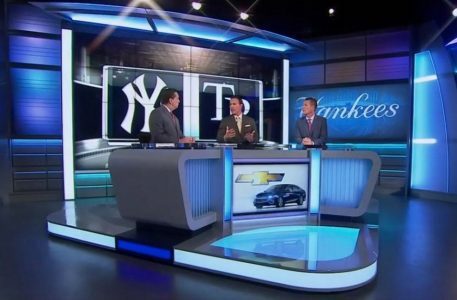 YES Network, the New York Yankee’s network that also covers the city’s Nets NBA team, has created a new broadcasting space that uses subtle nods to the team’s iconic pinstripes and the network’s rounded rectangular logo. The space, designed by James Yates, is dominated by an 80-inch flat screen with an illuminated frame echoing the logo shape and a vertically mounted one camera left that’s in portrait orientation or, as the network has dubbed it, the “baseball card” screen surrounded by textural vertical stripes. Meanwhile, a 4×4 video wall behind the main anchor desk is capped with a curved internally lit header and flanked by backlit columns. To break up the straight lines, an arched piece on either side adds visual interest, while the curved anchor desk’s front profile mimics the network’s logo, as does the riser. 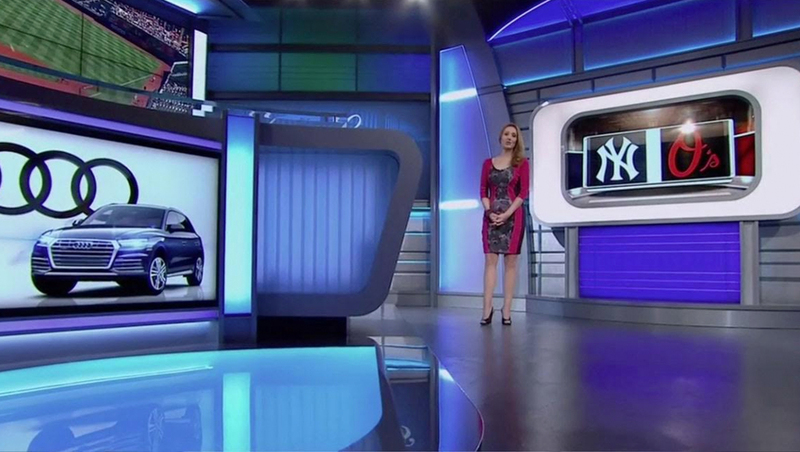 Select segments also use the anchor desk video wall to create graphics with virtual set extensions and baseball field imagery that make the space appear bigger than it is. In addition to the scenery fabrication by Creative Dimensions, the studio features high backlights and dramatic, blue tinted color accent lighting against the wall panels, giving the set a sophisticated look and feel with a sense of depth. The studio’s lighting design was created by George Greczylo. 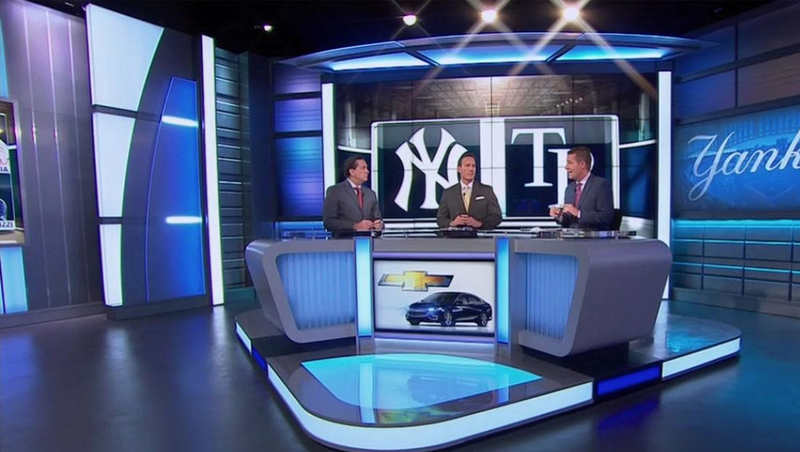 The set’s overall design strategy was to us both those lighting cues and video displays to create a flexible, multipurpose space that can be instantly rebranded for the Yankees’ pre and postgame shows as well as the Net’s pre and postgame broadcasts, which are both produced from the studio.